For the last twenty years, most of the United States has observed Daylight Saving Time from 2:00 a.m. on the first Sunday of April until 2:00 a.m. on the last Sunday of October. Starting in 2007, Daylight Saving Time will be extended so that it begins at 2:00 a.m. on the second Sunday of March and ends at 2:00 a.m. on the first Sunday of November. Windows XP will have patches available through Windows Update to make this change. Windows Vista is so new that it will ship with the 2007 schedule. There is a patch available for Windows 2000, but it’s only available to those who have purchased Extended Hotfix Support. I guess this is meant to encourage us to upgrade to Windows XP or Vista (or to punish us for not doing so already). 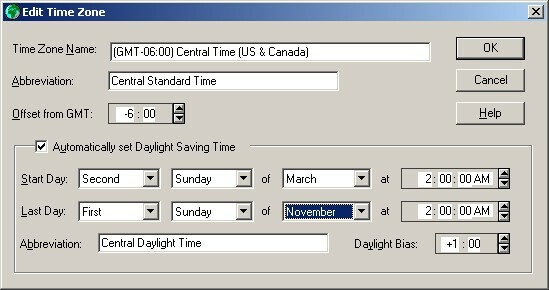 Instead, Microsoft has posted a page with instructions on how to change the Daylight Saving Time information manually. I thought their page was a little cryptic, especially for less technical users, so here are some simpler instructions. 1. 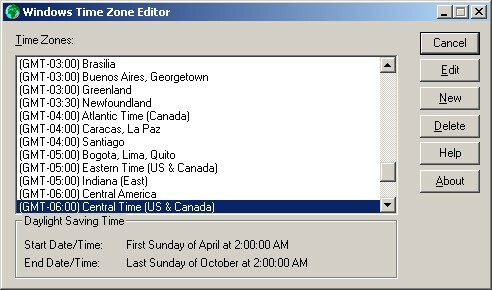 Download the Time Zone Editor from Microsoft here. (If that fails, go to this page and scroll down to the link, “Download the Tzedit.exe utility package now.”) Save this file to your desktop or somewhere easy to find. 2. Locate the file you just downloaded. It should be named “tzedit.exe”. Double-click it to run the program. Click the “OK” button to clear this window, then click the “Close” button in the original window (shown above). 4. Double-click the “My Computer” icon on your desktop. This is normally found in the upper left corner of your screen. 5. 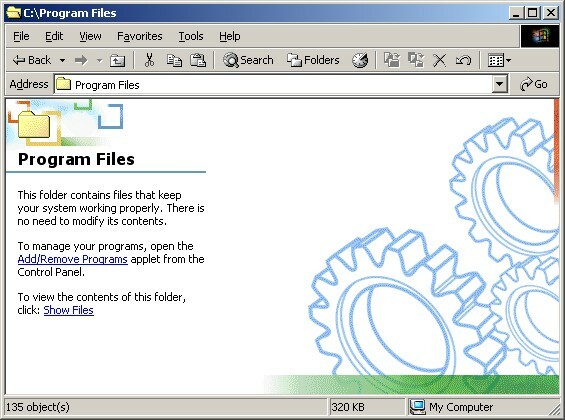 Double-click on your C: drive, then double-click on the “Program Files” folder. If the “Program Files” folder comes up empty, you will need to click on the “Show Files” link shown below. 6. 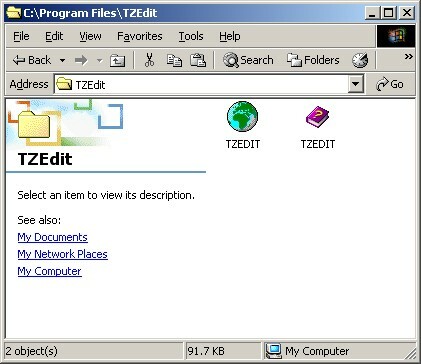 Double-click the “TZEdit” folder to open it. You should see two files. The appearance of the window might be different from the examples below, depending on your computer’s configuration. Don’t worry if it looks a little different. 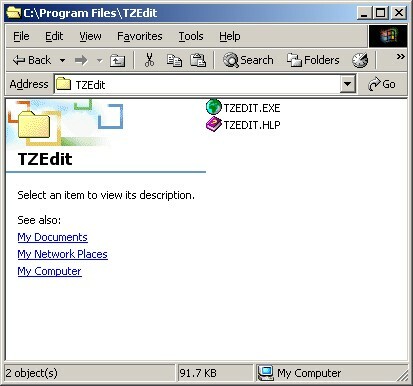 You should have one file named “TZEDIT” or “TZEDIT.EXE” that has a globe icon next to it, and another file named “TZEDIT” or “TZEDIT.HLP” next to a book with a question mark on the cover. 7. Double-click the globe icon. The following window should appear. Yours may show a different time zone, if you don’t live in the Central time zone. 8. 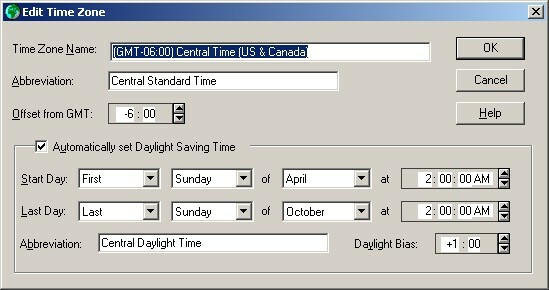 If the highlighted time zone is not correct for your area, click on the correct time zone to highlight it. If the highlighted time zone is correct, leave it alone. 9. Click the “Edit” button. The following window should appear. Again, if you don’t live in the Central time zone, some of the information may be different from what is shown here. Click the “Close” button. You’re done! Posted: January 23rd, 2007 under Computers.